VENICE, 6 FEBRUARY, 2018. The 8th edition of the Ca’ Foscari Short Film Festival, which from the 21st to the 24th of March will animate the beautiful Santa Margherita Auditorium in Venice, is back. Here thirty short films will be screened in the International Competition dedicated to cinema students from schools and universities from all over the world, along with special programs, tributes and masterclasses of just as much interest. The Festival, carried out with the collaboration of the Fondazione Ca’ Foscari, is the first European festival entirely conceived, organized and managed by a university and holds true to the mission of being a event created by young people, for young people. The Ca’ Foscari student volunteers are in fact involved in all the steps towards the realization of the festival, guided by experienced professionals and under the coordination of the creative and organizational director Roberta Novielli. The entire program will be introduced during the press conference on 27 February (11:30am, Aula Barengo, in the main Ca’ Foscari university building) by the creative and organizational director Roberta Novielli and by the university’s Protector of Cultural Activities and Relations Flavio Gregori. The International Competition, the highlight of the Festival, confirms itself this year as the most awaited event in Italy to discover the best emerging young directors currently attending or recently graduated from the most prestigious cinema schools and universities from all around the world. What can attest to their skills are the over 2.500 short films submitted from every corner of the globe bringing us a high-level selection in the most varied film styles. The selection process is not to be overlooked, as it is what gives new light to young cinema. It’s not surprising to find out that the countries with the most representation are the USA or India. However, the Festival has also embraced with enthusiasm the overwhelming number of applications from countries like Turkey and Iran (respectively in 4th and 5th place for number of entries): this by itself is a statement to the effort that countries which are usually deemed at the margins of worldwide cinema are willing to put to pursue the Seventh Art, with great values and traditions to back them up. Judging by this year’s ongoing selection (only thirty short films will be chosen from more than 100 countries ranging from the USA to Australia, from Iceland to South Africa, from Costa Rica to Uzbekistan, Indonesia, Colombia, Nigeria and many more) one theme in particular emerges, one just as universal as it is particular in its multiple declinations: that of the most visceral, intense and – artistically speaking – dramatic bond there is: the bond between mother and child. From the short films that have been selected, a few focus specifically on this topic, like The Day Mum Became a Monster by Josephine Hopkins. It is the story of a young girl looking forward to the moment when her divorced parents will get back together for her birthday, only to find out her mother behaving strangely, breaking the little girl’s frail equilibrium and turning her feeling of anticipation into a nightmare. In Tash Kөmүr, by Evgenii Chistiakov, the point of view is that of two young boys who both experience a troubled family environment and dream of a better life as they’re forced to work as coal miners in a small, remote village in Kyrgyzstan. The Hungarian short film Eric by Hakan Sagirolu depicts the tragic search of a Polish mother who will have to face her own ghosts in order to find her missing son. Something similar happens, even if in a completely different geographical context, in the South-African The Life of Ana by Mlu Godola, in which a young mother puts her son’s life in danger and needs to make up for her past mistakes to save him. Even more dramatic is the situation pictured in the Mexican short film Don’t Pass Through San Bernardino by Hugo Magaña; this mother won’t listen to the account of any institution and demands the truth about her son’s death. The murder of Pier Paolo Pasolini is the background of another Italian short film by Ludovico di Martino: Pipinara focuses on two young delinquents from suburban Rome, whose innocence is definitively lost once their life crosses that of the great Italian director and poet under terrible circumstances. Just like in all the previous festival editions so far, the Levi Prize for the best Soundtrack sponsored by the Ugo and Olga Levi Foundation for NPO musical studies, awarded since last year by a technical jury. Lastly, great news for this year’s edition is the possibility for the short films that have been selected to be chosen by TVCO for international distribution, a company leader in international distribution. 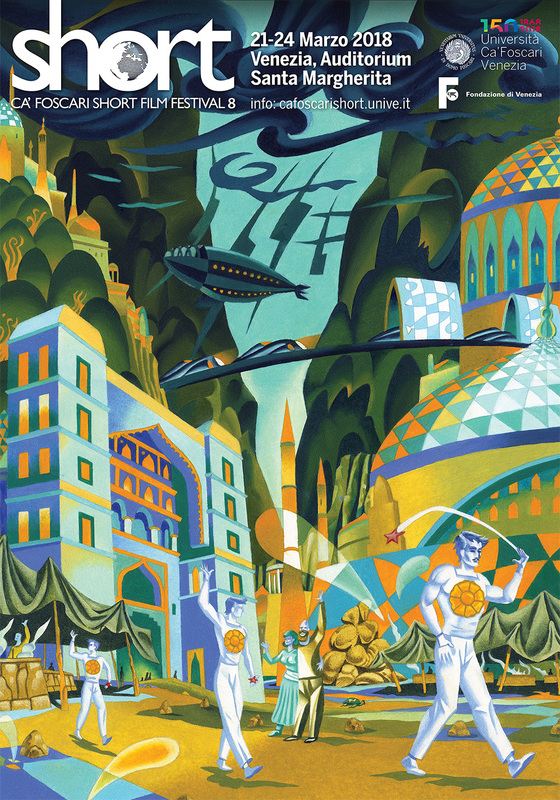 The great Italian illustrator, comic artist and painter Giorgio Carpinteri makes this 8th edition of the festival all the more valuable and interesting, by creating its poster for the second year in a row, an elaboration of a beautiful image taken from his most recent work Aquatlantic, a graphic novel dedicated to the lost city of Atlantis to be released later this year for Oblomov. The drawing represents a fantastical city in-between the sea and the East, thus recalling two elements that symbolize Venice as well. Furthermore, a subtle ode to cinema is embodied by the character dressed in white at the bottom of the image, moving as if in a sequence of three different frames. Carpinteri, who was a much-appreciated guest last year for a really popular tribute-interview, is one of the founders of the historical group of artists Valvoline Motorcomics, he has collaborated with all main comic magazines in Italy – from “Il Mago” to “Linus” – and he has published bulletin boards that have made it into national comic history, like the graphic novel Polsi Sottili. Since 1986 he is the creative director of television programs as well as author of numerous posters and advertising campaigns. This year’s special programs are rich and variegated, ranging from tributes to dedicated programs, workshops and guest interviews. Pride and honor of this 8th edition is surely the presence of our special guest Robb Pratt, renowned Disney animator, who will hold an unmissable masterclass. Pratt has been part of the team working on Disney classics such as Pocahontas, Tarzan, Hercules and he’s successively moved on to working on the storyboards for Planes and for other successful Disney Channel series like Mickey Mouse Clubhouse, Kim Possible and the more recent Elena of Avalor, which he is also the director of. Pratt has also worked as an independent animator, creating a series of short films depicting and reworking the role of a superhero, like in Superman Classic and Flash Gordon Classic. Recently he’s been working on the mini-series CARMAN: The Road Rage Anti-Hero, which has also been designed as an animation tutorial. Meaningful additions to the International Short Film Contest will be the Music Video International Competition, contest supervised by Giovanni Bedeschi and dedicated to music videos by students from both international and Italian schools, and the “Olga Brunner Levi” Prize, organized in collaboration with the Ugo and Olga Levi Foundation to select the best soundtrack in the International Contest. As this prize reaches its fifth edition, in name of the occasion it’s been extended from Italian high-schools to high-schools from all over the world, which will present a short movie dedicated to a female character and her relationship with music.